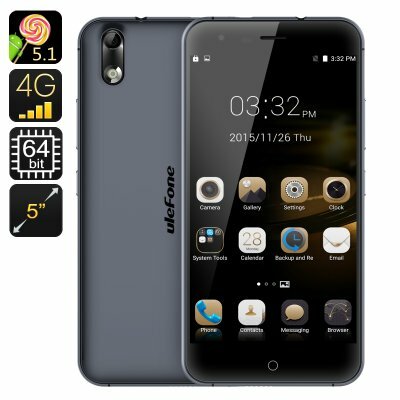 Successfully Added Ulefone Paris X Smartphone - 5 Inch HD IPS Screen, Corning Gorilla Glass, Android 5.1, 4G, Quad Core CPU (Grey) to your Shopping Cart. Coming from the famous smartphone manufacturer Ulefone, Paris X is a device that embodies elegance, functionality and years of expertise. It’s simple, full of contemporary features and perfectly-sized. One of the first things we look at when choosing a smartphone is the screen. The Ulefone Paris X won’t disappoint. The phone comes with a 5 inch HD IPS screen with Corning Glass protection and a 2.5D curve. The large display is perfect for watching movies, gaming, browsing the web and more. For quick navigation, you will have Smart Wake (simply draw a letter on the screen for quick access to the needed apps) and Gesture Sensing (wave your hand to skip a track or move between applications). The MTK6735P 64-bit chipset packs the super powerful Mali-T720 GPU, so that you can enjoy all the latest game releases in full and with no lagging. With 16GB of internal memory, you have plenty of storage space right on the device. Plus, you can expand that with 64GB more on a micro SD card. The smartphone comes with two SIM cards and covers a wide range of networks: 2G (GSM 850/900/1800/1900MHz), 3G (WCDMA 900/2100MHz) and 4G(FDD 800/1800/2100/2600MHz). The Ulefone Paris X comes with Android 5.1 operating system which offers an intuitive user interface and access to all the games and applications at the Play Store. With a 2150mAh battery, there are up to two hours of continuous talk time and 72 hours on standby. The smartphone comes with an elegant thin-bezel design in dark grey color and is a beautiful accessory as well as a feature-full device. The Ulefone Paris X Smartphone comes with a 12 months warranty. Brought to you by the leader in electronic devices as well as wholesale Android Phones..